NGC 7814 (also known as the Little Sombrero Galaxy and Caldwell 43) is an unbarred spiral galaxy of about 60,000 light-years across, located some 40 million light-years away from the Earth in the northern constellation of Pegasus (the Winged Horse), while it is receding from us at approximately 1050 kilometers per second. Together with NGC 14, PGC 38, 332 and 889, it forms the NGC 7814 Group. NGC 7814 is extremely bright, extended, and gets very gradually brighter in the middle. It is nicknamed the Little Sombrero Galaxy for its resemblance to the more famous Sombrero Galaxy (Messier 104). Both galaxies are seen edge-on, and both have extensive central bulges cut by a thinner disk with dust lanes in silhouette. 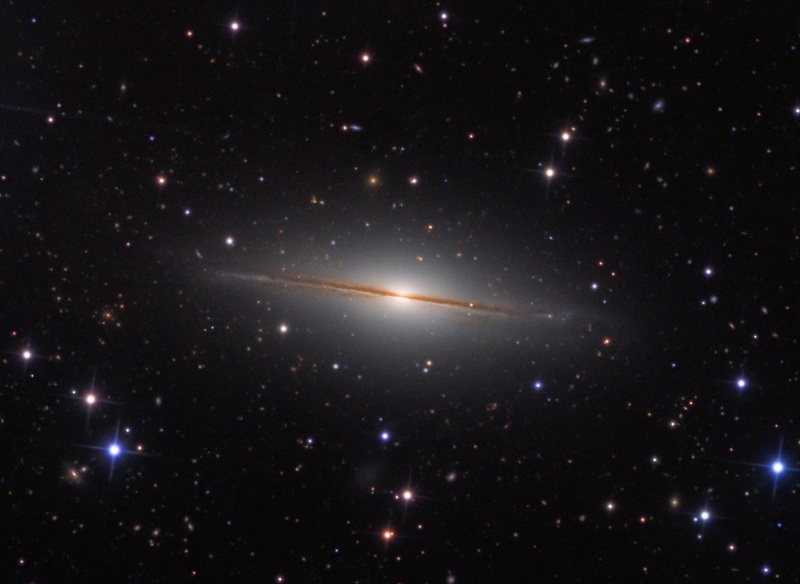 The Little Sombrero also has about the same physical size as its better known namesake, appearing to be smaller and fainter only because it is farther away (Messier 104 lies only about 29 million light-years away, in the constellation of Virgo). However, the Little Sombrero’s very thin dust lane is slightly warped and twisted, which is thought to be related to an earlier interaction with another galaxy. And, this galaxy has a very slight deviation from being truly edge-on. The background dustlanes can be seen “above” and through the halo giving this galaxy more depth than is usually displayed. The star field behind NGC 7814 is known for its density of faint, remote galaxies as can be seen in the image here. These far off galaxies have been used by astronomers to try to determine the amount of gas and dust in the halo of NGC 7814. As the light of background galaxies passes through the foreground halo of NGC 7814 it becomes dimmer (redder). Point your telescope toward the constellation of Pegasus and you can find NGC 7814 and the many distant galaxies. This image is taken in collaboration with Dr. David Martinez-Delgado ARI-ZAH University of Heidelberg.